2013! CAN YOU BELIEVE IT? 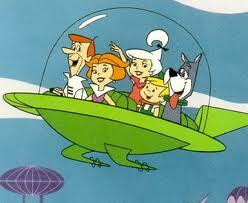 When I was a kid I figured the world would be more reminiscent of the Jetsons if we ever lived to see 2013! Of course I didn’t dare dream I would live to be (gasp) 47. I was a kid, after all, so how old is “old”, anyway? Well, when I was watching the Jetsons, 47 must have been the approximate age of Moses, or maybe even God Himself. I could NEVER DREAM of being as old as God, here in the “the future”. Jetpacks, flying cars, floating apartment buildings, routine space travel, robots that clean and cook and manage the kids, video chat, portable touch screens you could use to pull up the latest information about the world’s events, recipes, etc. Ok, so we really do have the last couple. I-pads, I-phones, Blackberries, Crackberries. We even have phones called Droids. Facetime, Skype. How much more Jetson can you get? Rosie isn’t cooking in the kitchen for most of us yet, but we can sure find whatever we would have her cook in the palm of our hand. Unfortunately, most of us don’t know how to turn on the oven any more. No worries, though. We can order it online and pick it up or have it delivered, though typically in a distinctly non-Jetson fashion. Cruddy, beat up 1995 Ford Mustang.OOPS. That’s the ad for my car. Sorry. Wrong post. 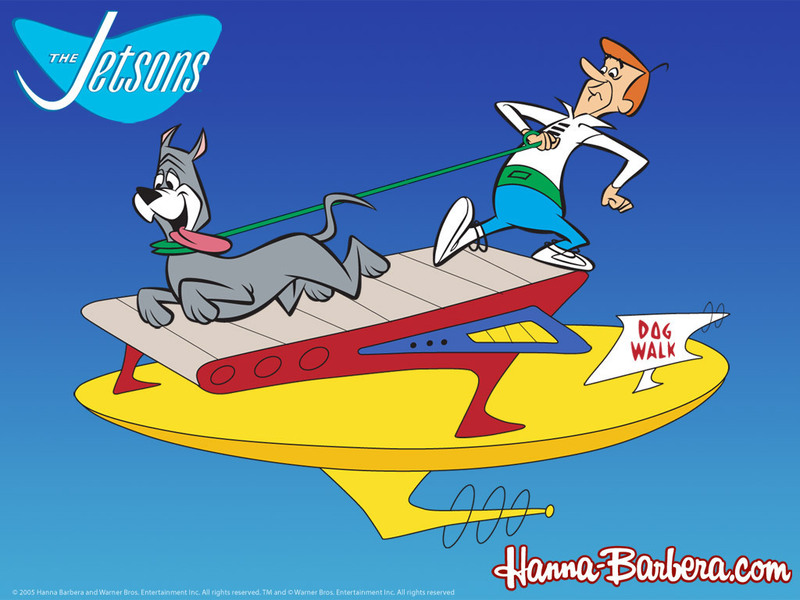 I guess the most disappointing thing about this not being a Jetson-esque era is that we don’t zoom around the sky in glass topped flying cars, making our way from the floating apartment complex with the daunting 3 minute commute to go to work at Spacely Sprockets. Don’t really know why we needed so many sprockets in a future digital age, but the Jetson’s was in the 60’s and 70’s, so what did we really know about the future? Anticipating lots of chain driven technology, were we? Well, we apparently knew enough not to make stinkin’ glass topped cars! Can you imagine how hot that would get? The enclosure would act like a magnifying glass, heating up the inside of the capsule and melting whatever is inside. Hmmm. On second thought, I guess we did try it didn’t we? T-tops? Moon roofs? Sun roofs? What was the problem? We got too hot! Duh. So what did we come up with to solve the problem? Added a sliding cover to keep out the sun. Clever, but not space age clever. Why couldn’t we use auto-darkening technology for the top section of the glass dome? It’s available in certain sunglasses or home windows. Why not in the roofs of flying cars? Oh I know. That’s probably what forced the bail-out. That’s right. We were finally ready to make the flying cars and somebody said “Hey, what about the melting driver syndrome? How about reflective roof technology?” And would’t you know it? Suddenly the auto industry went belly up and couldn’t make it without a goverment rescue operation. I think that’s the same thing that happened when the non-gas engines were introduced that would allow cars to run on air. Funny how that never came to fruition. George Jetson would be so disappointed. He never broke a sweat while flying. Hair never out of place. I guess maybe he was in great physical condition, running on the outdoor treadmill with Astro, the speech impaired dog cousin of Scooby Doo. I wanted to like Astro. Living in Houston, I love the space reference. However, I am surprised Astro wasn’t a brilliant, articulate, dog scientist or something. Scooby Doo and Astro supposedly lived hundreds of years apart. Are you telling me they could not make Astro more articulate in all that time? Geez. Mr. Peabody, Underdog, even Hong Kong Phooey were all dogs and each one of them could articulate better than “ruh roh”. Heck, Hong Knog Phooey was Scatman Crothers, not known as one our more articulate spokesmen, and he never said “ruh roh rorge”. Even Lassie could tell you that little Jimmy was stuck in a well and all she had to do was bark twice. I think Astro was a definite underachiever. “Ruh Roh Rorge” Really? Is that as creative as they could get? I mean Scooby said “Ruh Roh Raggy”, but he hung out with Shaggy, a prototype stoner who got off on scooby snacks, so I can see the issues there. Same actor in both shows? Can’t vary that pattern even a little? COME ON! Do your research. You have a dog that can talk, and he can say “r”, which happens to be one of the last developing sounds for children, but he can’t produce any of a multitude of other consonants that would be age appopriate for a 4 year old? HMMM. I am a speech pathologist, for cryin out loud. I know these things.Perhaps they should have named him “Scooby Can’t Do consonants other than R“. Here is something else that bothers me. Like you wanted to know. 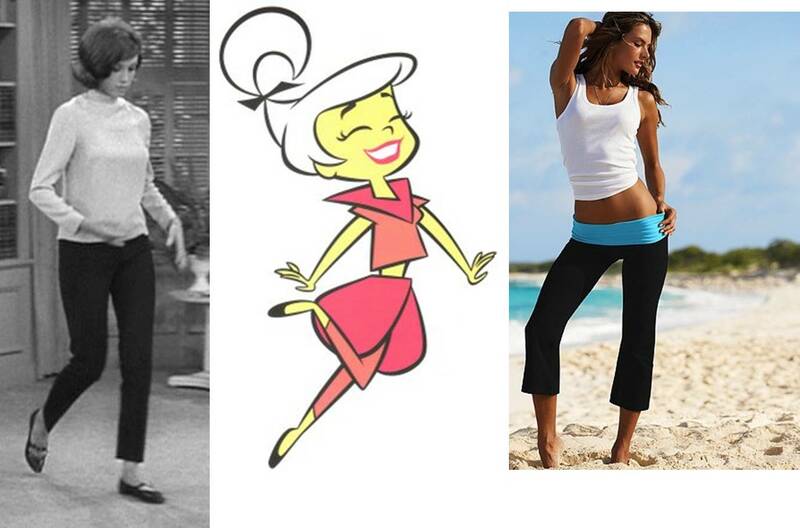 Is it just me or did Mary Tyler Moore, as Laura Petrie, wear the same type of leggings as Judy Jetson?.And aren’t they eerily like today’s Yoga pants? 2013. Welcome to the………. future? This entry was posted in HUMOR and tagged Bagman, Big Bags O Fun, blog, cartoons, clean, funny, Future, humor, Jetsons, memories, space age, technology, TEXAS, tv by Bagman. Bookmark the permalink.